I was just remarking to someone that I’m super getting into cucumbers lately, and that is, of course, a kind of ridiculous statement. In my defense, we were eating cucumber salad at the time, but still. Who gets into cucumbers? I’m going to start this recipe roundup by getting real with you and owning the fact that all my efforts at self-care went flying out an 8th-story office window for the better part of April and May. Last week I stared in the mirror and realized that I looked a lot how I felt: creatively & professionally fulfilled, totally exhausted, obsessed with red lipstick and liquid eyeliner (hello, learning curve)…and also desperately in need of some kale or something. Some cucumber, maybe. And with that: let’s cook our week, shall we? I heard on the interweb that somewhere in this country it’s summertime, although not here, because, San Francisco climate. But my kids are done with school for the year, and today I drove about 45 minutes across town to Lego Camp, which I guess means it’s summer vacation. (WHAT?? Where does the year go?) Anyway, in honor of Summer, Somewhere, I propose some healthy seasonal fare. Some grilled chicken with a savory sun-dried tomato salad, maybe? Some — wait for it — Vietnamese-style rice noodles with cucumber, perhaps? On another note, reading over this Recipe Roundup I realize it’s kind of an homage to the San Francisco Ferry Building: a sure sign that in my subconscious I am dreaming of long, sunny walks with Babygirl, browsing the farmer’s market stalls. Oh, life: hello. It’s good to be home. Sunday: Giant chipotle white beans from Heidi Swanson (love her). I use the giant beans from Rancho Gordo which I think are totally worth it, but you can sub in really any dried white bean you can find. The big drawback here is that you have to plan in advance because of soaking the beans and pre-cooking them (snore) which means it’s definitely more of a weekend dish unless you really have your act together. Monday: This Vietnamese-style salad. For a “cleaner” version, try using maple syrup in lieu of sugar and cut the sweetener down by half so it’s more savory. The first time I made it I also I used chopped hard-boiled eggs for the protein instead of pork (largely because it was kind of a spur-of-the-moment call when I was trying to use up some mint, and I didn’t have pork in the house) but I am sure the pork version is delicious. Tuesday: Balsamic glazed chicken thighs and spring mix salad with sun-dried tomatoes and basil olive-oil dressing. Wednesday: Grilled radiccio salad with tuna. Have I written about this before? The recipe is at the end of this post. I am obsessed with roasted chickpeas and with grilled radiccio (so gourmet-sounding, no? ), and my husband and I created this version out of a mashup of other recipes. I say “grilled” here, but we don’t have a grill (sigh) so we make ours in a cast-iron skillet; in any case, it’s a flexible recipe (feel free to substitute garbanzos for cannelinis or great northern beans, if you prefer). And it’s equally tasty with a balsamic dressing if you like a bit of sweetness. Thursday: Mahi-mahi tacos with loads of skillet peppers & onions, Whole Foods 365 salsa (my favorite, by a long shot), and a kale & avocado salad. Friday & Saturday: This weekend we strike out on our annual family camping trip to Lake Del Valle, where it will actually be hot and dry, and where we will sleep in a tent with a window out to the stars. The weekend is all about grapefruit margaritas and meat cooked over open flame: chicken marinated in lemon, olive oil, and oregano, served with hummus and pita for at least one meal, and a good burger fix for another. (Note: Instead of beef, I’m into buffalo for its slightly gamey flavor and it’s purported health benefits; also because buffalo tend to be more humanely raised than cattle and are far more likely to be grass-fed.) Served on GF buns from Mariposa (the bessssssst) with arugula salad. Meats, greens, and even a little grilling. Clean eating, summer style. Happy June, folks. Preheat oven to 375. Spread garbanzos on a sheet pan and toss with a good glug of olive oil, a generous sprinkle of sea salt, and 1 – 2 tsp of the herbs. Roast for 20-30 minutes, until dried and crispy (check frequently after 20 minutes to be sure they don’t burn). Heat a heavy cast iron skillet over medium-high heat. 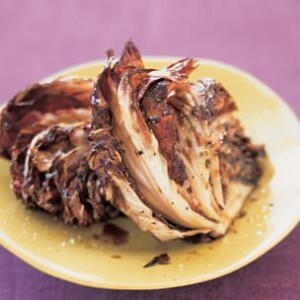 Coat radicchio wedges lightly with olive oil. Place wedges on hot pan and sear on both sides until radicchio is wilted and slightly brown, approximately 3 minutes per side (it should be soft, not crispy). Transfer grilled radicchio to a cutting board, remove cores, and roughly chop leaves. In a large serving bowl, combine arugula, radicchio, tomatoes, flaked tuna, and garbanzos. Toss together with lemon juice, olive oil, and a sprinkling of salt until well-dressed. Top with parmesan cheese and parsley. Serve warm.